house of peru has touched the lives of many people in the San Diego area by planting the seed of love in the community and volunteering at the highest level with a touch of humanity in so many ways. This is the legacy of our founder, and we will undoubtedly continue reaching out and touch lifes. we are all volunteers willing to serve our community and so proud to promote our peruvian culture. Carlos was born and raised in Tarapoto, Peru, lived and studied in Chiclayo, Peru, and has recently moved to San Diego (3 years ago) with Michael, his husband. Carlos holds a Bachelor's Degree in Business Administration with specialization in Human Resources by the Catholic University Saint Toribio of Mogrovejo in Chiclayo Perú. Carlos has over 5 years of broad-based experience in human resources, recruitment, negotiation, training and development and employee benefits. His last job in Peru was working as a Supervisor in Human Resources at Petro Peru in Piura, he was in charge of managing the Welfare Team & Social Services. His most recent job in the US was as a Billing Specialist at AMN Healthcare. Carlos’s involvement with the community started many years ago when he realized that this world will be better if each of us gives a little bit of their time to serve others. Carlos was a Founder/Member of AIESEC Chiclayo, a young worldwide non-profit organization. He is also a current Associate Director of Rob Benzon Foundation, a charitable organization that serves LGBTQ community. ​Carlos has been involved with House of Peru since 2017 and joined the Board of Directors in May 2018 as Recording Secretary, few months later he became the President of the organization. He and all the Board Members as well as other volunteers are working tirelessly to achieve a wonderful dream: to have a cottage that promotes Peruvian culture, this is Carlos’s biggest goal with House of Peru. ​Marisol joined House of Peru in 2005 when she met its founder, Gladys Jones (Novinger), she was mesmerized by her kind disposition to serve the Peruvian community as Honorary Consul and the unlimited love towards Peru. Her constant talks about culture, tourism and philanthropy embarked Marisol in a journey that has continued for the last 13 years. Marisol was born and raised in Lima, Peru. Marisol worked at the Korean Embassy in Lima for 6 years as an Executive Assistant and then embarked in the adventure of moving to the USA in 2000. She attended MiraCosta College and got an Associate’s degree in Business Management and an Associate’s degree in Liberal Arts with Emphasis in Behavioral Science. Marisol is fluent in English and Spanish and knowledgeable in French. She is continuing learning different languages as she has been lucky enough to work at the English as a Second Language Non-Credit program at MiraCosta College in Oceanside, CA for the last 3 years, where she gets the chance to meet students from around the world on a daily basis, embrace the diversity, share the different cultures and introduce them to our beautiful San Diego community. ​Marisol loves the beach, listening to vintage records, reading and doing genealogy research. Her family is the engine that powers her energy and she would have not achieved what she had without them. She has the most artistic partner, five beautiful daughters and two cats. ​Diana and her family joined House of Peru around 2004-2005 and helped out periodically. She formally joined House of Peru in 2013 after finishing college and coming back to San Diego. She loves the purpose of the organization, to share with other the marvels of Peru. She used to do presentations about Peru in her High School and always loved it. Diana works as a Graphics and GIS technician at the City of Escondido, and has worked there for 4 years. She is in charge of providing any sort of graphic advice or general graphics (posters, flyers, envelopes, banners, photo montage, renderings, image enhancements, etc), printing small and large items for events or meetings, updating city maps and aid city officials in their public presentations and reports. She gets to see a wide variety of projects and that’s what she likes her job. She is proficient with design and GIS softwares, and crafting tools. When Diana arrived to the U.S., her English level was below basic. She is somewhat proud to have learned the language fast enough for her to complete high school at the honors level as well as attend college, and then graduate. Finishing her Master’s will be another accomplishment that she will be quite proud of. Diana enjoys crafting, model building, gaming, and animes, being a personal growth the most important in her life. She is passionate about professionally, urban planning, community development, and cultural events. ​Monica was born and raised in Lima, Peru. She attended Cambridge College, a British school in Lima, which allowed her to be fluent in both English and Spanish. She then moved to California and obtained a B.A in Media Studies and Mass Communications from the University of California at Berkeley. Shortly after graduation she moved back to San Diego. Monica has 10 years of experience in client relations and over 6 years in Project Management specializing in IT consulting, and Data & Analytics. Her passion for volunteer work started back in Peru when she was a teenager volunteering at orphanages in the capital city of Lima. She has been involved with House of Peru since 2007 when she joined the organization as one of its Princesses and later represented us as the Queen for House of Peru. She later joined the Board of Directors serving as Vice President, and she is now our Secretary for 2019. She has also worked with other non-profits like Big Brothers Big Sisters and Borer Angels. Monica's favorite things are travelling, enjoying the arts (opera, galleries, theater, music, etc. ), Zeke (her baby dog), and spending time with friends and family. You can also find her planning her wedding, coming in September of this year. 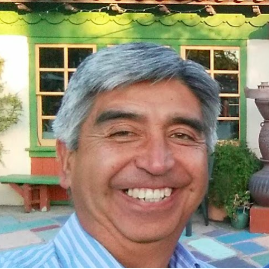 Julio has been involved with House of Peru since 2016, and joined its board in September 2018 as Director of Corporate Relations, focusing his efforts on establishing strong links with major companies in San Diego and Southern California. ​Julio was born and raised in Lima, Peru, and has been living in San Diego for over 20 years with Monica, his wife, and his 2 children, Gaby and Sergio. He went to Pontificia Universidad Catolica del Peru and got his degree in Bachelor in Science, Industrial Engineering; he was able to use his technical knowledge and management skills for many years at Qualcomm, and his most recent position was Vice President and General Manager, Latin American Operations at Omnitracs. Julio brings years of experience working for large corporations, building and leading strong teams to accomplish strategic goals. House of Peru’s goal of having a cottage-museum at Balboa Park, to promote and share Peruvian culture, is also a dream for Julio, reason why he joined the organization, so it will be his contribution to Peru, the beautiful country where he was born. Rosa is part of the board members since August 2018! She started shadowing/learning about the organization in July of 2018 for the July 28th Lawn Program event, always loved her birthplace - she came to this country (on vacation - SHE THOUGHT!) in June/July of 1987. She wanted a chance to meet/help share her heritage with her American family! Rosa is a Facilities Coordinator for Genentech, has been there for a few years. Her main work consists of compliance for Facilities and Engineering group. What she likes most about her work is working with a great team. Rosa is really good at Organization, technical writing and simplification. Rosa is raising two kids - they challenge her daily on servant leadership! Little eyes are always watching and learning from her - so it is SO important to demonstrate to them what a GREAT servant leaders is. Rosa enjoys surfing, gardening, cooking, fishing, crocheting, hula, and reading; as well as sewing and spearfishing/diving. ​For Rosa, the most important things in life are God, Family, and country and she consider herself really passionate about being self sufficient! She loves learning skills that increase confidence in abilities to handle anything life can throw at you. ​Born and raised in San Diego, Gayle had always loved to dance at her parents social gatherings which persuade them to introduce her to formal training of that love of dance and began taking tap dancing lesson, later followed by ballet, a jazz. At the age of 17, Gayle attended a Peruvian Independence Day celebration in which, for the first time, she saw Peruvian Folklore and instantly fell in love with Peruvian Dance and Culture. Gayle joined the House of Peru in 2004 and worked her way up from Princess, to Queen, then becoming Queen of Queens of the House Pacific Relations Queens organization. She began dancing with mentor Miluska Kirnus, learning festejo and later progressed to learning other dances from videos on YouTube. So much was her passion for her culture, she moved to LA and began studying Peruvian Folklore from renowned dance director and choreographer, Fredy Chiara who also introduced her to Alessandra(Mosita) Diaz and Cesar Aguirre who she studied under for the Club Libertad Los Angeles Marinera Norteña dance competition. Gayle, now having moved back to San Diego, is dedicated to teaching dance and choreographing performances for all House of Peru events with the help of PeruVive OC and their directors Cesar and Natashia Aguirre. Gredna joined House of Peru in 2014 when Marisol invited her to be part of the organization and her daughter Brittany also became part of House of Peru as a Queen of the organization. Gredna loves supporting House of Peru as she embraces her Peruvian heritage and she is always willing to help. Gredna is graduated as Teacher in Child Development. Her skills are communication, problem-solving and management. She manages her own business as a Child Care Facility since 17 years ago. Her biggest accomplishment was to have her own business and become independent, and she is very happy about hat. For Gredna the most important thing in life is Freedom by living her own life on terms, finding the way of peace, realizing she has more potential than she thought, raising her daughter and single parenting, being able to still find ways to learn and grow every day. She is very proud of herself. She enjoys volunteering for House of Peru, she also enjoys meditation, dance, doing arts, reading and walking. She would never give up on her dreams. She is passionate about what she does on her business as well as volunteering in House of Peru. Silvana is a helpful and hardworking Peruvian International Chef & Pastry Chef who has experience and passion for great food and mouthwatering desserts. In 2012, after working as a Pastry Chef for many renowned Peruvian chefs, Silvana opened “il Travaglini”, a bakery shop providing custom cakes and traditional Peruvian desserts in Lima, Peru. Silvana was also the Executive Chef for TIGO, a well-known Peruvian yogurt and cheese company, having some of her recipes and interviews published in different magazines. She’s also been interviewed by local Peruvian radio stations for gastronomy series talks about Peruvian desserts and their history. A few months after getting married and moving with the love of her life to the United States in 2016, she met Marisol del Solar and she invited her to help at “House of Peru” showcasing some Peruvian pastries at their Balboa Park events since she had just started her own Peruvian Pastry business in San Diego. “Since I met the organization, I couldn’t be away from this beautiful and kind community and this amazing dream of building our own “House of Peru” at one of the most beautiful parks in San Diego... That’s when I started volunteering at all their events as a chef, as part of the culinary team”. Finally, in 2019, I was called to help in the organization as the Director of Marketing and Public Relations.